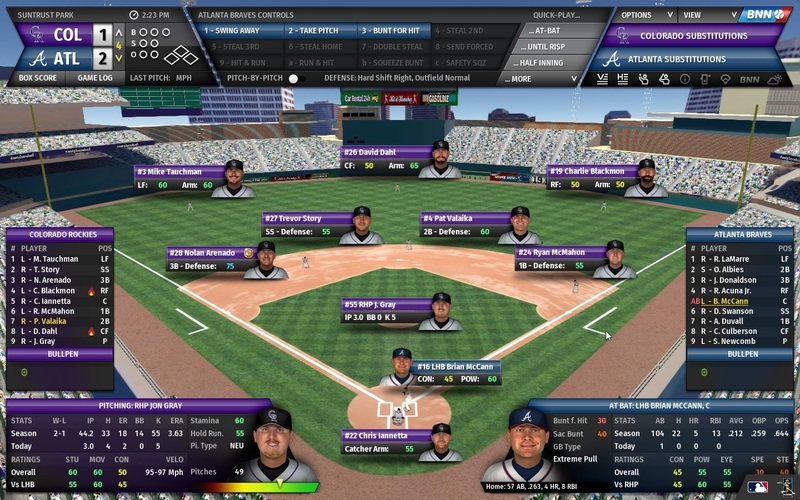 Perfect Team Mode 2.0-Perfect Team Mode isn’t technically new (it was added to Out of the Park Baseball 19 late last year) but this is the first time I am able to write about it as my review last year was posted far before it came out. This mode does involve microtransactions but it does give you enough to get started and you can earn more cards as well. The concept is very similar to What If Sports, a browser game that allows you to put together players from different teams and years (every year of each player’s career is graded separately so you could say pick the 2015 version of Bryce Harper instead of the less amazing recent versions). That game required a pretty substantial entry fee for each season you played, Perfect Team involves smaller microtransactions to purchase card packs. Like What If Sports, in Perfect Team you are assembling a team of players from the past and present (over 3,200 cards are available) to compete in leagues and tournaments (which won’t be available until at least April). Almost everything else works exactly like usual for Out of the Park Baseball. As this is only the second season for this mode, most of the improvements for Out of the Park Baseball 20 are for this feature. New features include tournaments, collection missions, an improved auction house, a new league play level, a record book for the Perfect Team leagues, and more. New “Live” services-Out of the Park Baseball 20 is now kept up-to-date with the actual 2019 MLB season meaning you can start a new simulation on say June 3, 2019 and all stats, ratings, rosters, and standings will be accurate based on what happened in the real MLB season to that point. This is optional of course so if you start a simulation later in the season, you can still give your team a fresh start by beginning with Opening Day again. New animations for the in-game experience-These include fielders making diving plays and shoestring catches and also batters celebrating walk-off home runs. It’s always nice to see some new animations for the in-game experience but I do wish they would have spent some time on fixing the old ones first. You still periodically have fielders hanging onto the ball when its obvious they could have gotten an out or the occasional runner appearing to beat out a throw but still being called out. I know this is nothing wrong with the simulation but it is frustrating beyond belief when your fielders appear to just stand there doing nothing when they should have plenty of time to make a throw (even though in reality they don’t have a play). New strategic options-These include the controversial (at least to baseball “purists”) “opener” and follower pitching positions and improvements in the simulation engine to make smarter strategic decisions. I don’t really see a team (in real life or Out of the Park Baseball 20) using an opener very often so this is just a minor inclusion. The other part of this is so vague that it’s hard to know what actually changed. However, I didn’t really notice any strange decisions made by the simulation engine (though I can’t recall the last Out of the Park Baseball game where I actually noticed something like that). More improvements in trading, logic, roster building, and player evaluation-As usual you aren’t really going to notice these behind the scenes changes but they add up year after year and continue to make Out of the Park Baseball 20 the premiere baseball simulation game on the market. Four new international leagues-The baseball leagues of Germany, France, Spain, and the Czech Republic (and their real players) are added to the game. It’s always nice to see additions like this but unless you are a European baseball fan, I don’t really see most players utilizing this (other than maybe the odd player from those leagues making the jump to the MLB). New achievements-I know achievements aren’t for everyone but I personally am a huge fan of them. Out of the Park Baseball‘s achievements have been getting quite stale (they used to be the same ones year-in and year-out) so some new ones are nice. About half of them are the same old ones but there are 66 new ones to achieve. Improved player ratings and defensive evaluations for historical players. Teams can now participate in multiple tournaments at the same time. New tiebreaker calculations (considering how the 2018 MLB season almost had a tiebreaker apocalypse in the National League, this is a minor but somewhat important addition). Support for players in lineup to back up other positions and substitute in starting lineups. Graphical spray charts to help figure out how you should deploy shifts. Improved interface and HTML reporting. Outside of Perfect Team (which was technically introduced last season but has seen a lot of improvements and additions this season), Out of the Park Baseball 20 doesn’t really add anything too significant to the table. Still, the series was already the best of the best in the baseball simulation genre anyway. There aren’t a lot of things that can be done to improve this already great series. As I always write, the decision on whether to purchase Out of the Park Baseball 20 comes down to whether or not you already own a game in the series, how much you play it, and whether or not the new additions interest you. If you don’t already own an Out of the Park Baseball game and are interested in giving a baseball simulation game a try, there’s really no reason not to pick up this version. If you enjoy the game but haven’t purchased a new version in a few years, I think you should upgrade since the last three or so years have added a lot to the game. If you have a recent release in the series, it probably comes down to how much you play the game and whether the new features interest you. Regardless, Out of the Park Baseball 20 is the culmination of twenty great years of baseball simulation and is still the clear leader in the genre. Geeky Hobbies would like to thank Out of the Park Developments for the review copy of Out of the Park Baseball 20 that was used for this review. Other than receiving a free copy of the game to review, we at Geeky Hobbies received no other compensation for this review. Receiving the review copy for free had no impact on the content of this review or the final score.